A 45 year old man comes off his motorbike on a country road. He is flagged up as major trauma and gets the full works, including WBCT. This reveals nothing other than 3 undisplaced rib fractures on the right with no underlying haemo or pneumothorax. He is comfortable after the morphine given by our good paramedic friends. All specialties evaporate from the trauma call and his wife arrives with a desire to take him home. Shall I write his discharge summary asks the F2? We are in a bed crisis after all and the next major incident is just round the corner. But do you want to send him home? There is reasonable evidence to suggest a high rate of complications in this cohort. Some of these complications can be life threatening. However, we are pragmatic clinicians. If we are going to bring him in, then what are we hoping to achieve? We could champion the evidence supporting the use of thoracic epidural analgaesia to reduce pain scores and LOS in this cohort, although this has been recently criticised. A critical care admission maybe, for an arterial line and serial gases? Is that too excessive? Maybe the ward and a PCA and physiotherapy/cough assist? Maybe we just want to watch him for a bit in ED short stay; the underutilized diagnostic test of time and symptom progression can sometimes be the best of all, as our paediatric minded friends will endorse. Whenever there are multiple options like these, then opinions practice and standards will vary between clinicians and hospitals. There are some guideline documents available, but they are not overtly pragmatic or generalisable. The levels of evidence quoted are often weak. There are also some great FOAMEd summaries from our international friends; a shout out should go to this great one from shortcoats in EM for neatly distilling the previous evidence. But there is little definitive to direct your care with clinical confidence. What strategy will be best for this patient in front of us? I’m sure that many of you, as I do, will feel that these patients get a raw deal. We’ve talked a bit about surgical interest and fracture fixation recently, but this seems fairly far off pragmatic use at present and in my experience outside of cardiothoracic centres, most specialties will show little to no interest in this type of trauma. Thus our mission creep persists, and management of blunt chest trauma is fast becoming yet another EM/Critical Care franchise. Essentially, they developed a prognostic model using fairly simple bedside variables to determine the likelihood of serious complications for patients with blunt chest trauma presenting to the emergency department. They defined serious complications as one or more of the following: mortality, morbidity (defined as any chest complication including PTX, HTX, pneumonia or empyema), ICU admission and prolonged LOS (>7 days). The outcome was composite, meaning achieving any of the above marked you as ‘disease positive’ on logistic regression analysis. What’s the difference between a clinical decision rule and a prognostic model then? How can we assess the quality of a study like this? Good question. I always turn to the Ottawan grandmaster himself, Ian Steill, for my advice on prognostic modeling and decision rules. He has published advice previously about checklists for these studies. If podcasts are more your bag there is a great interview here courtesy of Emergency Medicine cases. The authors do not mention these checklists but do comment on their use of structured guidelines published in the BMJ 2009. This is testament to their prospective sincerity. Was there a need for a prognostic model? I think you can argue yes to this, for the reasons explored above. These patients get variable care currently and have a high incidence of complications. Streamlining clinical decision making and management could benefit them hugely. Was the rule derived according to methodological standards? Hmm. This is where it gets a bit tricky. I have 2 main issues here, mostly with the development phase. The authors identified what they considered to be important prognostic variables based on previous work. This is slightly flawed, as many studies will define the important prognostic variables based on a large prospective dataset as part of the whole project. They then identified these predictor variables within the derivation cohort retrospectively. That means there would be no blinding of assessment and so if the researcher identified a complication early in the notes, s/he would be likely to look harder for the presence of predisposing risks. Also the retrospective absence of a recorded risk factor does not necessarily mean this risk factor was not present. It was not asked about prospectively. Secondly, the outcomes forming the composite are numerous, occasionally subjective and sometimes misleading. As a composite, we are inclined to think severity of disease goes up as positive outcomes increase. However, in this case it may have meant the admission of more patients to a critical care environment. Does this mean they were sicker, or does it mean that the hospitals were getting more proactive due to Hawthorne effect? Reliability of the predictor variables is also an issue here. ‘Chronic lung disease’ could be interpreted a number of ways by different clinicians. Also, Number of rib fractures can be variably recorded and often incorrectly noted, depending on the modality of imaging and whether you include ‘clinical’ fractures or otherwise. Again not a very reliable predictor unless everyone is having the gold standard (CT). Has the rule been prospectively validated and refined? The model was prospectively validated over 7 hospitals, in a cohort of 237 patients. This is quite powerful data. In addition, it was refined and adjusted in line with international guidance to produce a model of ‘best fit’ that would allow the allocation of scoring integers for each variable, such that clinicians could calculate a bedside score. With a cut off point of 11, the authors report a sensitivity of 80% but a specificity of 96% and a positive predictive value of 93%. They also assessed the full model using a c-statistic (the decision rule equivalent of a ROC curve, with AUC value). This appeared to be excellent at 0.96 (95% CI 0.93, 0.98). Has the rule been successfully implemented into clinical practice? Not yet. What is ideally needed now is a diagnostic randomized controlled trial. 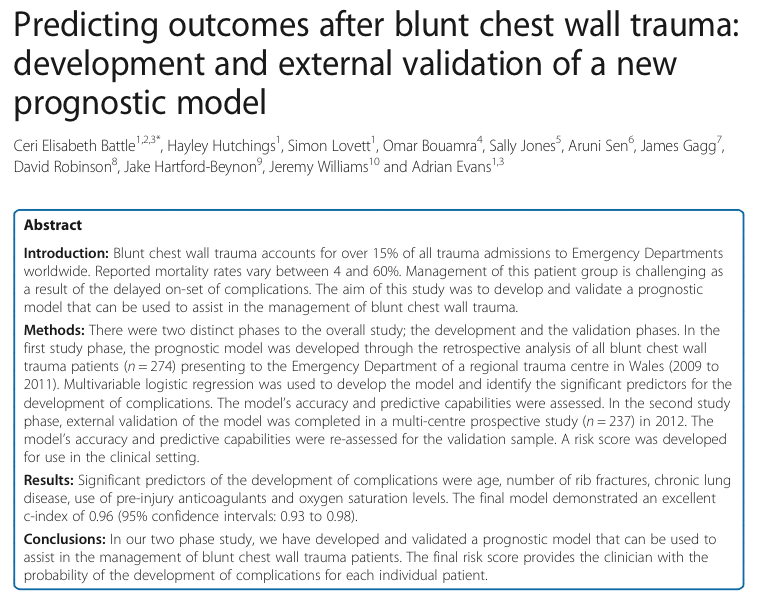 Patients with blunt chest trauma could be allocated to disposition via prognostic model or clinician preference, with robust follow up. This would be a challenging trial to deisgn and implement; it would need to be open label by definition, therefore centres may begin to change practice within the study either due to Hawthorne effect or observation of anecdotal improved outcomes with either arm. Alternatively, randomization could be by hospital, week or clincian. This would introduce confounding that may limit interpretation of results. Is the rule cost effective? Who knows? I suspect only if they can show an appreciable decrease in length of stay, ICU admission and mortality will the model prove to be cost effective. This is a secondary issue for me though. I think it would take a huge and complex study to prove cost effectiveness for this type of prognostic model. If it can be proved to improve patient care and clinical decision making, I would be tempted to adopt prior to definitive information on cost. Will we be using it? An interesting question. I don’t think the score is ready for primetime for several reasons. Firstly, it is actually a little challenging to calculate, with 5 variables and non intuitive incremental gain. For example, each rib fracture buys you 3 points, increasing decades of age 1 point, each 5% decrease in SpO2 5 points etc… This could easily be overcome by an app or incorporation of a mathematical model to a smartphone score repository, that allowed simple data input. Until then, I would worry about the inter-rater reliability. Secondly, the sensitivity of the score is actually relatively low in diagnostic terms. Hence, even using the suggested cutpoint, 1 in 5 patients who develop complications will test negative using this model. This will not sit well with many clinicians. Lastly, the final, refined score itself has not really been trialled in a clinical environment. I would want to see further validation studies, external to this research group, before I would be happy to introduce the score to others and categorically recommend it. What I will likely do is intuitively try to adopt some of the scores salient points into my gestalt. There is evidence here to support the hypothesis that pre-injury anticoagulant use and chronic lung disease both independently double the odds for an adverse outcome in blunt chest trauma. Increasing age and number of fractures also increase risk, as previously documented. These latter 2 factors, in tandem with hypoxia, are relatively well known indications for aggressive management of blunt chest trauma. I don’t think the paper adds a great deal to decision making here: I would always admit and treat aggressively if the patient were hypoxic for example; I don’t need a score to tell me that saturations of 85% are a bad thing…. Hence, my thresholds for admission and observation, patient controlled analgaesia, epidural placement and critical care admission will likely adjust slightly based on the presence, absence or severity of the above factors. But I think on balance, the use of this rule would be hard to defend at present if things went badly following your disposition decision. A clinical decision ‘based on my clinical examination, assessment and discussion with the patient at the time’ will always make more sense to someone retrospectively reading your notes than the adoption of an unvalidated and as yet unadopted risk score. Love to hear your thoughts. I bet loads of you have protocols for this. If you can, send them over so we can compare and contrast. I like the term mission creep as well. Using it makes me feel just a tiny bit like a member of the SAS. • early access to epidural pain management (within 6 hours). This is partly a reflection of the fact that the national agenda is being driven strongly from QMC currently (you’ll find their guidance here: http://www.ukemtrauma.com/uploads/3/0/6/6/30664511/mt_guidelines_jan_2014.pdf) They are also strong advocates of early rib fixation and argue that this is significantly reducing LOS and length of ventilation for their trauma patients. Agree entirely with your bottom line regarding this particular paper. I think the one thing we can be sure about is that we underestimate the signficant of chest injuries at our patient’s peril. A simple rule of thumb is that they always get worse before they get better (pain, contusions, respiratory function etc) so err on the side of caution! As to serratus anterior blocks: no experience at all!